When you testify before a legislative committee, it can be a dry experience. Not because legislative staff pulls the water from the table, but rather because the script can be information-heavy and data-driven. Testimony can be dry and maybe even boring. So it was a welcome change when Minnesota House of Representatives Capital Investment Committee chair Mary Murphy kicked off the 2019 Legislative session in January by issuing this challenge to state agencies pitching their bonding projects to her committee. “Tell us inspirational stories about past state bonding projects,” Murphy said. Jessie Diggins at the 2018 Olympics. Star Tribune photo. For those readers who aren’t political geeks, capital bonding is when the state borrows money to fund infrastructure and building projects, like major facilities, roads and bridges, and major repairs and upgrades to state facilities. Murphy’s challenge teed it up pretty well for Minnesota Amateur Sports Commission (MASC) and National Sports Center (NSC) director Todd Johnson, when he testified before the committee on January 31. The MASC is a state agency charged with promoting the benefits of sports participation in Minnesota, so he was better positioned to tell inspirational stories than other agencies whose track record was more about repairs and maintenance. “It was February 21, 2018, Pyeongchang, South Korea. Afton, Minnesota’s Jessie Diggins unleashes a torrid come-from-behind sprint, passing the world’s top sprint skier Stina Nilsson of Sweden, and the USA wins the Olympic gold medal in the women’s cross-country ski team sprint. It was the U.S.’s first Olympic gold medal in cross-country skiing, ever. 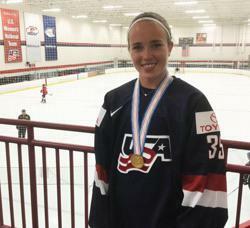 Maddie Rooney at the Super Rink, a facility partly built (and repaired) with state dollars. Hard to get more inspirational than Olympic gold medals, you’d think, right? 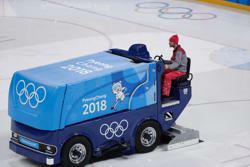 Ryan Hevern driving the Zamboni at the Pyeongchang Winter Olympics in 2018. But Johnson added in one more unique inspirational story. One of the ice technicians at the NSC, a MASC facility, is Ryan Hevern, and his story was different, but no less inspirational, than Diggins’ and Rooney’s. Johnson asked him to attend the hearing in person and tell his story. Ryan Hevern shot this photo of the USA Women's Hockey Team celebrating their Olympic gold medal. Hevern told the story of learning from his peers in the close-knit community of Minnesota ice technicians, moonlighting on the ice crew at the Xcel Energy Center, finally rising to the point where he was invited to work at the Pyeongchang Olympics in 2018. He was assigned to drive at the Gangneung Hockey Center and found himself standing behind the glass at ice level when Rooney made her game-winning save. 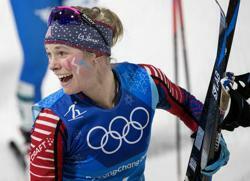 Jessie Diggins won her third Minnesota State High School cross-country ski championship in 2010 at Giants Ridge, at a facility partially funded by state bonding dollars. Pioneer Press photo. Three Minnesota Olympians – two champion athletes and one skilled ice technician -- who learned their skills on facilities built with State of Minnesota capital bonding dollars administered by the MASC.